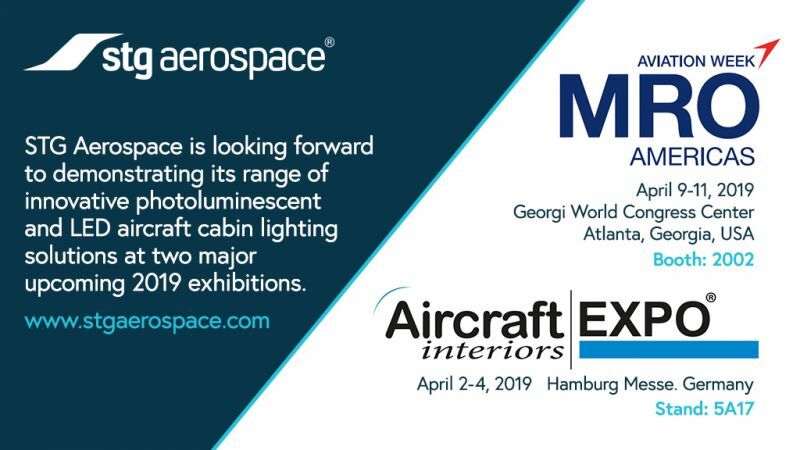 STG Aerospace is looking forward to demonstrating its range of innovative photoluminescent and LED cabin lighting solutions at two major upcoming exhibitions. Being held from 2nd to 4th April in the Hamburg Messe, Aircraft Interiors Expo (AIX) is the world’s leading event for airlines and the supply chain to source the latest innovations, technologies and products from the cabin interiors, inflight entertainment and passenger comfort industries. AIX will play host to more than 1200 of the most influential airline buyers from around the world with over 550 exhibiting companies dedicated to the passenger experience. In addition to demonstrating its entire portfolio, STG Aerospace will also be taking the opportunity that AIX offers to launch a brand new product. Also in April, from the 9th to 11th, STG Aerospace will be exhibiting at MRO Americas which is being held at the Georgia World Congress Center in Atlanta. Bringing together airlines, MROs, suppliers, OEMs, regulators and industry experts, MRO Americas is the premier event for the commercial air transport MRO industry. This event will provide a world class venue for all those involved in the MRO sector to exchange ideas and best practices, share experiences, debate issues and challenges and gather knowledge. For STG Aerospace, this will be an excellent opportunity to meet potential new customers as well as existing clients.